Video is where it's at in social media marketing today, particularly on Facebook. Each day, an average of 100 million hours of video are watched on Facebook, while it's estimated that mobile video will account for 75% of total mobile data traffic by 2020. But more than just considering the wider video trends alone, what's really important on Facebook is grabbing attention with your video, and quickly, as people scroll through their News Feeds and your content autoplays. The massive shift towards mobile internet consumption and the subsequent rise in online media to meet that demand has lead to a drastic reduction in both our overall attention spans, and the subsequent time it takes for users to make a decision on whether they want to consume a piece of content or move on. According to recent research it now takes only 0.25 seconds of exposure for people to recall mobile feed content "at a statistically significant rate". That likely means you also only have a similar amount of time to make a connection and convince a viewer to stick around and watch your video content. Facebook's stated this before in their video tips - with content that autoplays in the News Feed, you need to ensure you're grabbing attention right off the bat, or users will just scroll by. Indeed, according to Facebook's own data, people are spending, on average, 1.7 seconds with a piece of content on mobile compared to 2.5 seconds on desktop. And given the aforementioned prominence of mobile in the modern media landscape, that reduction in time is important. You need to ensure your content stands out. To answer this, Facebook conducted a study of more than 850 English-language-only video ads that were served to users in the US and in Europe between Q4 2014 and Q4 2015. The research team recruited a group of people with non-advertising or creative backgrounds to view the ads and complete a series of questions to evaluate their experience with each ad. "Each video ad was evaluated twice on 19 different questions grouped within four creative dimensions: first impressions, branding, messaging and video features. To mimic the mobile News Feed experience, the raters first watched the first 10 seconds of the video ad with sound turned off. Next, for a more in-depth evaluation of the video ads, the raters watched the first 30 seconds of the video with sound turned on. This data allowed us to understand what proportion of video ads met each of the 19 test criteria." The researchers then correlated their results with Nielsen Brand Effects study data to get a more accurate measure of ad recall. 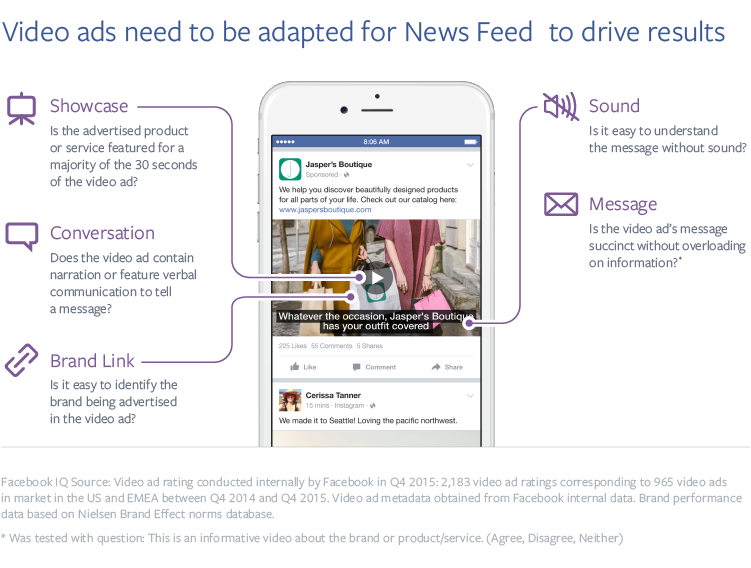 Based on this, the Facebook research team has established a range of recommendations to help video advertisers boost the performance of their ad content and get users to pay attention. 1. "Optimizing video creative for feed"
As per Facebook's previously noted advice, the first thing the research team recommends is that video advertisers consider how their ad plays in the Facebook News Feed - with no sound and with the user scrolling through to look at other content. 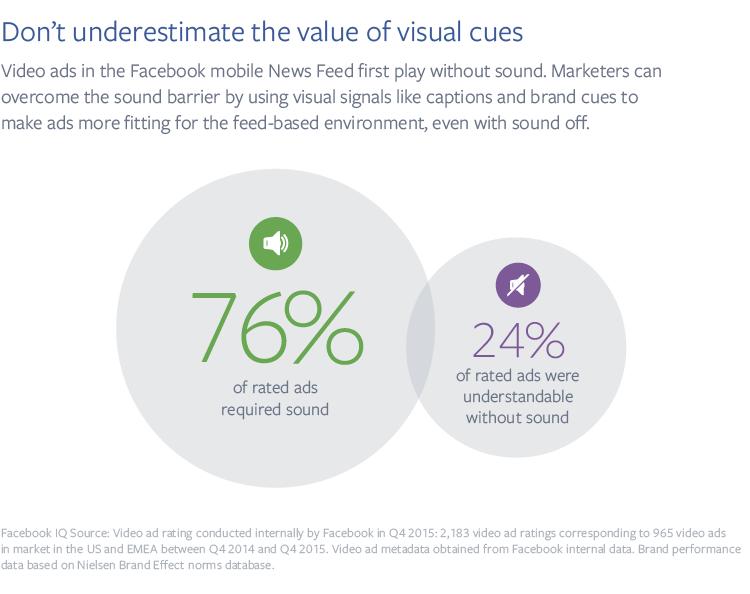 Because of this, Facebook recommends brands focus on putting their key messaging up front to get viewers' attention quickly - and ideally, that message should be communicated without relying on audio. The above stats are what lead to Facebook recently adding their automated video caption tool in order to help brands boost the performance of their content by reducing the reliance on audio. A big part of the problem in this aspect is that video is an audio-visual medium, it's designed to have audio, and as such many creators haven't yet adjusted to making video content without sound specifically for Facebook's feed. But definitely, this is an aspect to keep in mind - you've only got a second (or less) to grab attention, you need to make it count. 2. "Bring your brand to the front"
This is an interesting one, and one that somewhat goes against traditional thinking. 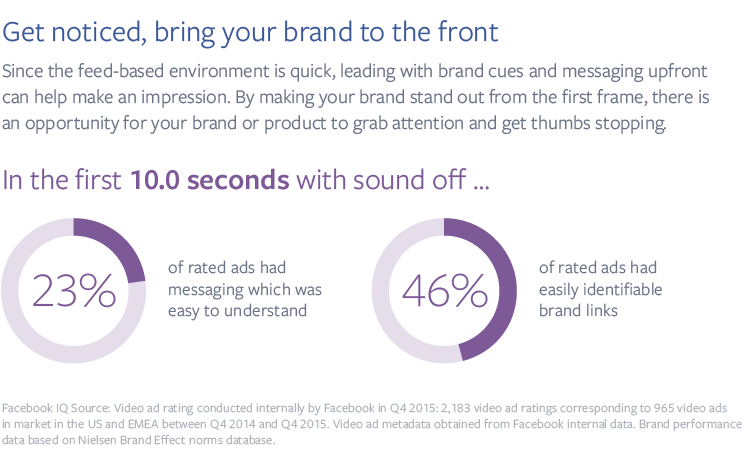 Facebook notes that of the ads they played without sound, only 46% of them were seen to have had easily identifiable brand links present within the first 10 seconds. Additionally, without sound to assist with context, only 23% of the ads had a clear brand message within that first segment. This is an important consideration - if you want to maximize your brand message, you need to ensure that message is clear and up front. Of course, this can go against the storytelling element of your creative, it can be harder to make your ads less overt and subtle, which can turn viewers off anyway, but as people scroll by, you need to consider how your messaging connects with your brand quickly and helps clarify your aims in those initial, soundless frames. 3. "Breaking through and making video ads memorable"
Through their research, Facebook was able to establish some key characteristics which helped boost ad recall, which are important to note. "We saw that the strongest Ad Recall scores occurred when video ad creative showcased the products or services, included conversations and brand links and got the message across succinctly with the right amount of information." It's an interesting checklist to keep in mind - while it can be difficult to incorporate all these elements all the time, Facebook's data shows that these are the most effective elements in boosting recall, which can also lead to improved ad performance. 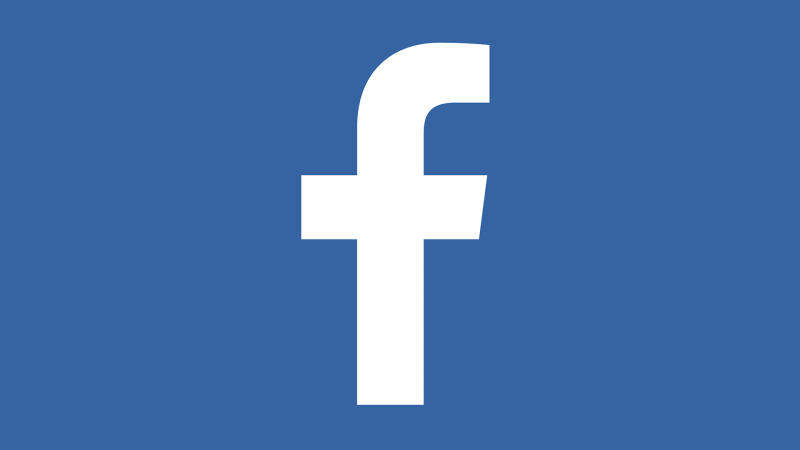 Video is always a challenge in this regard - and moreso in Facebook's News Feed. You need your branding to be overt, but you need your creative to shine through so your content isn't too 'in your face' and upfront. Creating good, compelling video content is a big challenge, but given the rising emphasis on video content, and the subsequent increase in expectation for such from consumers, Facebook's guide provides some solid pointers on how to maximize your video ad performance and generate better response. Even if you don't or can't incorporate all of it, it's a good guide point to start from as you test and refine your video campaigns. The full report "Capturing Attention in Feed: The Science Behind Effective Video Creative" is available here.